The Persian War is one of the most famous, and most fascinating wars in human history. It was fought in the fifth century BC between Persian Empire, far and away the largest and wealthiest kingdom on earth, and a collection of independent Greek cities who lived in relative poverty and obscurity. The Greeks had not a fraction of the wealth or population of the Persians, and were themselves disunited and engaged in perpetual conflicts, yet they soundly defeated the Persians and retained their independence and freedoms. The Persian war was remarkable not only for its ferocious battles, which showcased the superiority of Greek military methods, but also for the striking personalities involved, the democratic character of the military command, and the ability of the fractious Greeks to drop their strong divisions and unite behind a single cause. It is a popular war to study, not only because of its striking military engagements and historical significance but also for the great human dramas that were played out behind the scenes. Ionian Revolt : 499-449 B.C. The most famous battles of the Persian war were fought on mainland Greece, but the conflict began in Asia minor, when the Greek colonies of Ionia, revolted against their Persian overlords. This rebellion was called the Ionian revolt, and lasted from BC 499, to 494. It began when rebels, under the leadership of a Aristagoras of Miletus, sacked and burned the local capital city of Sardis, and ended when the Persians retook Miletus and crushed the rebel stronghold, after the naval battle of Lade. Darius I., the Persian king was very incensed that Athens had lent ships and military support to the rebellion, and determined to raise an army to invade Athens to punish it for its interference. During his campaigns to put down the rebellion, he had conquered much of Thrace and Macedonia, and so he already controlled much of the territory he would need to launch an invasion from the north. The first expedition he prepared was led by his son-in-law Mardonius, in 492. It crossed the Hellespont into Thrace, but the entire fleet was destroyed by a sudden storm off the Chalcidice Peninsula, and he returned to Persia. Aristagoras † Son-in-law of Histiaeus. Led Rebellion of Greek Colonies in Asia Minor. Second Persian Invasion (under Darius) : 490 B.C. Darius launched his second expedition in 490. This time, the entire invading force, including cavalry, was sent by ship across the Aegean Sea. The expedition was led by Artaphernes and Datis, two Persian commanders who had put down the Ionian rebellion, and Hippias, an exiled Athenian tyrant. The Persians first besieged and captured the main city on the Island of Euboea before landing in Attica on the shore of Marathon. The Athenians, ten thousand strong, were awaiting the arrival of reinforcements from Sparta, but under the influence of Miltiades, a general who had previously been one of the leaders of the Ionian rebellion, they attacked immediately, just as the Persians were breaking camp. Although the Persian forces were much larger, they were surprised and routed with great loss. Callimachus † Polemarch of the Athens army at Marathon. Made the decision to attack. Third Persian Invasion (under Xerxes) : 481-479 B.C. The Persians did not attack Greece again for ten years, but after Darius's son Xerxes became king, the Persians launched another expedition against Athens. This time they were determined to use overwhelming force so in 481 BC , Xerxes gathered together an army of several hundred thousand infantry and a navy of six hundred ships. He demanded that the Greek city-states submit to him without resistance, and many did, including Thebes. The Athenians and Spartans however, insulted the Persian ambassadors and vowed resistance to the end. Fortunately for all of Greece, the Athenian politician, Themistocles, had foreseen trouble years ahead of time, and had convinced the Athenians to begin a navy-building project so by 481 BC , Athens had a navy of over two hundred ships. While Xerxes gathered his army at the Hellespont, the 31 Greek city states that had decided to resist the Persians, were fielding a united Greek army, under the leadership of Sparta. Themistocles led Athens' fleet, and although a Spartan admiral was in chief command, Themistocles was very influential in all naval operations. The first great battle of the united Greeks against Xerxes army was at Thermopylae, a narrow pass in the north of Thessaly. 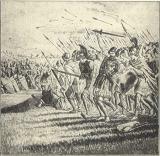 It was there that the Spartan King Leonidas, with 300 Spartans held out for three days against the entire Persian army. After a lopsided battle in which thousands of Persians were slaughtered by Spartan's tiny force, the resolute defenders were eventually surrounded and killed to a man, and Xerxes army passed unopposed to Athens, which it burned to the ground. As soon as the pass of Thermopylae was lost, the Greek fleet worked full time to evacuate Athens and its surrounding communities to local islands. They were stationed on the island of Salamis, in sight of the ruins of Athens, when after a fit of contentious infighting, the decision was made to give battle to the Persians at once. The famous naval Battle of Salamis ensued, during which the Greek fleet won a dramatic and decisive victory over the much larger Persian navy. The Persian fleet was destroyed, and Xerxes returned to Persia, leaving Mardonius in charge of the conquered region. It was not until the following year, however, that the Spartans realized that the Persians had no intention of meeting them at their fortified isthmus, and emerged from their Peloponnesian stronghold. Then, at the hard-fought Battle of Plataea, they drove the all the Persians from the Greek mainland. Soon after the Battle of Salamis destroyed the Persian navy, the Ionian Greeks in Asia minor started a new rebellion. At the Battle of Mycale, fought at the same time as Plataea, the Greeks won a major victory in Ionia, which freed the Island of Samos from Persian control, and Athens agreed to protect it. This was the beginning of the Delian league, and the foundation of the Athenian Empire. Mardonius † Brother-in-law of Xerxes and commander-in-chief of Xerxes's Army. Leonidas † Spartan King whose whole army died defending the pass of Thermopylae. Leotychides Spartan commander of the Greek fleet at the battle of Mycale in Asia Minor. Over the following thirty years, Athens continued to fight battles with Persia for control of the dozens of Greek colonies in the Aegean Sea. It was not until 448 BC that a treaty finally ended hostilities between Athens and Persia, and by that time Athens was the dominant power in the Aegean Sea. Cimon † Athenian statesman and general. Fought Persians in Ionia after the war. Friend of Sparta. Megabyzus Persian General. Son of Zopyrus of Babylon. Grandson of Megabyzus, one of the seven conspirators. They crashed into the Persian army with tremendous force.